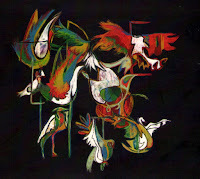 bebop spoken here: CD Review: David Ferris Septet - Alphabets. David Ferris (piano/comp/arr); Hugh Pascall (trumpet); Richard Foote (trombone); Chris Young (alto/soprano); Vittorio Mura (tenor/baritone); Nick Jurd ((bass); Euan Palmer (drums) + guest vocalist - Maria Väli. Poetry and jazz have never been my idea of compatible bedfellows. In fact poetry, with or without anything, has rarely been my preferred reading/listening. This may have been due to being blitzed with Shakespeare during my misspent schooldays. However, since then, Cleo Laine gave Shakespeare a reprieve with the release of her album Shakespeare and all that Jazz and I subsequently read The Complete Works over a relatively short period of time. I also met up with Dr Keith Armstrong, an internationally renowned, locally based, poet who, over the years, has kindly provided BSH with the occasional jazz-based poem and, in the process, caused me to soften my feelings. Confronted with Birmingham based David Ferris’ debut album, my old suspicions re-emerged and I procrastinated. However, I eventually succumbed. First, though, rather than dive in head first, I read the poems without any musical distractions – thank you Google you’ve saved me a lot of time scouring the shelves of our local library. The wordsmiths are, Ted Hughes; Seamus Heaney; WB Yeats and WH Auden. In truth, I couldn’t claim they made total sense to me but most of the words did have a certain abstract beauty about them and I would have liked them to have been included in the notes, enabling me to maybe, just maybe, get the message. As it turned out, such was the compatibility of music, words and voice that any misgivings were soon swept away along with the need for the written word. Estonian born Maria Väli’s voice brings understanding to the words that the printed text failed to do (for me that is) and the compositions and arrangements of Ferris lift the whole to a higher plane. And, as if this wasn’t enough, the solos by the horns let you know in no uncertain terms that this is a Jazz album (I capitalised the J intentionally). The opening instrumental, Chorale, lays down the direction we’re heading in. It’s lush, it’s violent, and it’s tranquil with perhaps a hint of Mike Westbrook in the ensemble writing. Hear it as you will and, hopefully, like me, come the final track, see jazz and poetry, as envisaged by David Ferris, as the new fusion. Crow Hill - Ted Hughes. The Hawk - WB Yeats. The Willow Wren and the Stare - WH Auden.